I had to read all about this song this morning, as I’d pretty much forgotten all about it. I mean, I never forgot it – it got so much radio play when I was about 16 it is probably eternally etched in my head – but I hadn’t heard it in almost thirty years. It is really quite the archive of a certain time and place. One thing that is striking is just how many of these singers are still incredibly familiar. Yes, some of them went on to have very limited careers (James Ingram and Steve Perry may now be the least famous of the soloists), but for the most part these are 80s icons. It was easier to be an icon in those days. Musical tastes were so much more limited by commercial radio and MTV – it was nearly impossible to escape from a Michael Jackson or Huey Lewis even if you were a punk rock listening kid. 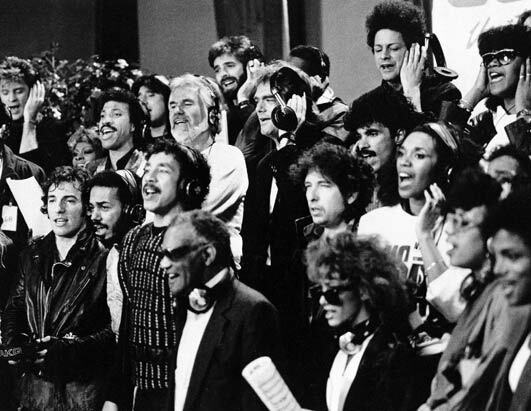 They were completely ubiquitous, and “We Are the World” is a cloying celebration of that ubiquity. The best thing that I found today is this video of Dylan recording his three lines. It runs about nine minutes and you get to hear a somewhat confused Dylan trying it several different ways, and also get to see Jones and Stevie Wonder sort of massaging him through it. It is a really fascinating document about working with big egos in a setting like this. I may not like this song at all, but I do admire the ability of Jones to simply get the thing done with all of those type A personalities in one room. 1985 will be the year of Dylan and the benefit – he will close Live Aid, help launch Farm Aid, and tell the world that he “Ain’t Gonna Play Sun City”. But this is the one that kicks it all off.